Disclosure statement: Morten Wendelbo does not work for, consult, own shares in or receive funding from any company or organization that would benefit from this article, and has disclosed no relevant affiliations beyond their academic appointment. Partners: American University School of Public Affairs provides funding as a member of The Conversation US. The real rub ? Be you contractor or federal employee ..you by law can not seek out alternative temporary employment during the shutdown without full approval of the Ethics Committee … which ironically … is furloughed during the shutdown ! Disclosure statement: Deborah Y. Cohn does not work for, consult, own shares in or receive funding from any company or organization that would benefit from this article, and has disclosed no relevant affiliations beyond their academic appointment. Retail holiday sales amounted to an estimated US $720 billion in 2018, with about 10 percent of those purchases being returned. Disclosure statement: lewis Mandell does not work for, consult, own shares in or receive funding from any company or organization that would benefit from this article, and has disclosed no relevant affiliations beyond their academic appointment. For example, if Makayla’s federal student aid is $10,000 per semester while her tuition and fees are $6,000, Maykayla’s refund would equal $4,000. The purpose of the refund is to help pay her other expenses such as books, a computer and personal items. The payment card, which would work like a prepaid debit card, could simplify the payment process by transferring the refund directly from Federal Student Aid to the student, bypassing the need for the college to cut a check or otherwise transfer the refund to the student. In this Jan. 10, 2019 photo, Speaker of the House Nancy Pelosi, D-Calif., meets with reporters in her first formal news conference, on Capitol Hill in Washington. 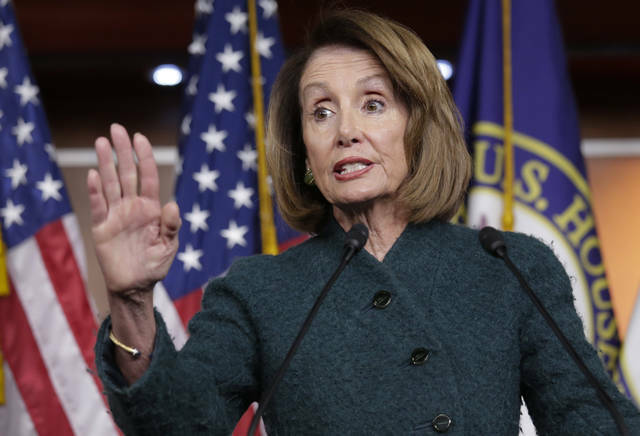 Pelosi has asked President Donald Trump to postpone his State of the Union address to the nation, set for Jan. 29, until the government reopens. https://www.sunburynews.com/wp-content/uploads/sites/48/2019/01/web1_122142535-93e432075a7a4bdb9804e4b7ff2d1fda.jpgIn this Jan. 10, 2019 photo, Speaker of the House Nancy Pelosi, D-Calif., meets with reporters in her first formal news conference, on Capitol Hill in Washington. 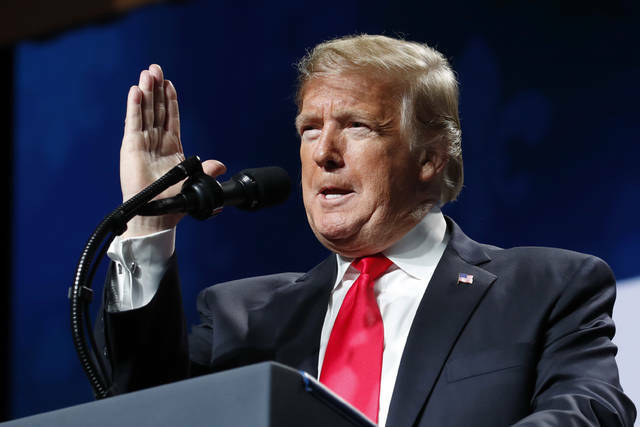 Pelosi has asked President Donald Trump to postpone his State of the Union address to the nation, set for Jan. 29, until the government reopens. https://www.sunburynews.com/wp-content/uploads/sites/48/2019/01/web1_122142535-ac82d33a51804d20b2d09a49ea5858bb.jpgA portion of a letter sent to President Donald Trump from House Speaker Nancy Pelosi, Wednesday, Jan. 16, 2019 in Washington. 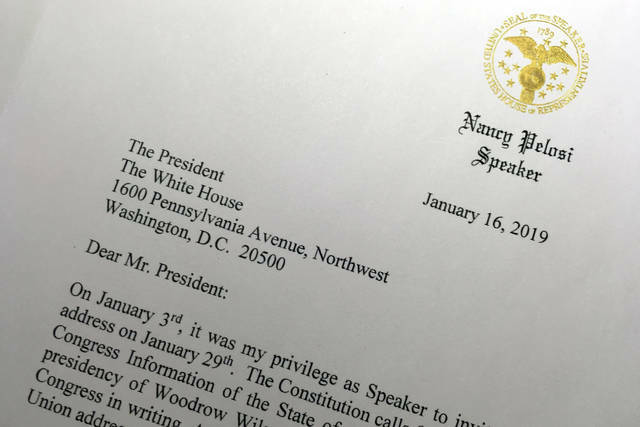 Pelosi has asked President Trump to postpone his State of the Union address to the nation, set for Jan. 29, until the government reopens.